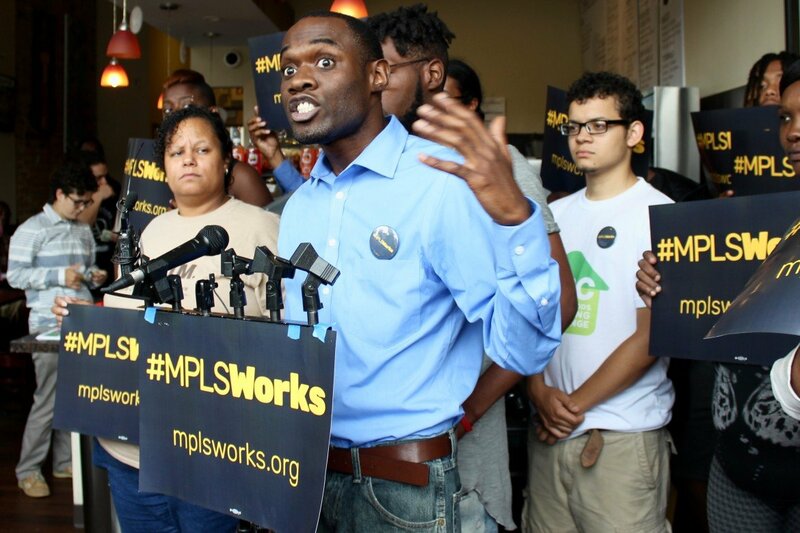 Neighborhoods Organizing for Change (NOC) Field Director Mike Griffin rallies workers at Avenue Eatery on the Northside of Minneapolis. Although it was mainly a plot to cool out radical activism, Labor Day is widely remembered as a celebration of the successful fight for the eight-hour day. Yet, while we’re approaching the United States’ 121st official Labor Day, it is now impossible for low-wage Minnesota workers to support their families while working only eight hours a day. This system of economic inequality and the struggles that Shields’ mother and over 220,000 minimum wage workers in the Twin Cities metro area face today, along with how activists across the country and in the Twin Cities are fighting for fair wages and schedules, remind local labor historian, Peter Rachleff, of the 1886 fight for the eight-hour day. He also sees similarities in the strategies of the two movements, in that they both aim to impact all workers through changed labor standards instead of solely unionized workers through contract bargains, the latter of which has been the norm since the 1940s. This approach is especially beneficial at the present day, since currently only about ten percent of U.S. workers belong to unions, according to Rachleff. We’re unlikely to gain another federal holiday out of this movement, however, since Labor Day wasn’t even really founded to remember the eight-hour movement, but to avoid its controversial history. The movement climaxed during a May 1886 protest, which ended in police and striker deaths, a spark of fear in the labor movement and the creation of International Worker’s Day, which is still unofficially celebrated in the U.S. on May 1. However, there was no official Labor Day until 1894 when President Grover Cleveland offered up the September holiday on the opposite end of the calendar year. Read more about the labor movement’s history in Rachleff’s story on Labor Day’s turbulent origins. Over a century after the eight-hour struggle and the first Labor Day, the holiday is now dominantly seen as the barbeque between pools closing and schools opening. However, for thousands of workers and activists across the state and country, it is a day that marks the growing force of today’s workers’ rights movement and serves as a reminder of the harsh conditions low wage workers still face in 2015. These gains are being made by the collaboration of many organizations in the Twin Cities, including 15 Now, NOC, Centro de Trabajadores Unidos en Lucha (CTUL), SEIU Local 26, and Working America. #MPLSWorks, a coalition of many of these groups and more, launched a workers’ rights campaign this August. The collaborating organizations’ original missions range from unionizing janitors and security officers, to supporting non-unionized low-wage workers, to racial justice, but they have all come together in a time of changing definitions of labor to defend all workers’ rights. “The working class has changed, the work people do has changed, and therefore, not surprisingly, the ways they organize and the way they struggle change also,” said Rachleff. Minnesota’s labor movement has seen some recent successes as a result of this narrative shift and organization collaboration. Thanks to legislation passed this Spring, Minnesota has the highest minimum wage in the Midwest at nine dollars an hour. In addition, after a long period of increasing reliance on subcontracted workers, falling wages at the MSP Airport and subsequent protests advocating for $15 an hour, around 3,000 low-wage airport workers have gotten a one dollar hike in their minimum wage, raising it to ten dollars an hour. Even though Minnesota has seen a small increase in minimum wages, there is still nowhere near a living wage throughout the state. In Hennepin County, for example, two working parents need to each make $17 an hour to provide a no-frills life for a family of four. Raising the minimum wage is an issue of race, gender and economic equity. According to 15 Now Minnesota’s website, while 28 percent of all Minneapolis residents live in poverty, that percentage is 65 for American Indians, 49 for African Americans and 34 for Latinos. Further, women work the majority of low-wage jobs in Minnesota and across the nation. Other mental and physical sacrifices also come with working low-wage jobs, especially ones that don’t have fair scheduling practices. Other issues Twin Cities activists are working on are wage theft (when employers don’t pay employees for hours worked) and a lack of paid sick and safe days. According to a NOC survey of around 550 North Minneapolis residents, sixty percent of surveyed workers did not have paid sick days. This number was even higher for retail and food service employees. This lead to ten percent of them leaving a job because they or a family member had fallen ill. In addition to their experiences with unfair labor practices, another thing Thornswood, Adams, Hedges, and Shields all have in common is their Labor Day plans: organizing to better labor standards. This story is part of a Daily Planet series on low-wage workers and the Twin Cities labor movement. Lennox Thornswood, why was being outside alone at night scary as a woman? Did you know men are statistically more likely to be victims of violent crime in that scenario? I was on board with this article until a couple little things like that implied women somehow have it worse than men. This seems excellent on paper, but not all employees think this is “fair” scheduling. If you work in a restaurant and you’re scheduled to work on the patio but it rains then they can call you off. If your employer has to pay you regardless then they’re going to make you come to work anyway even though you wont be serving a purpose. Really, I’d like the night off to go to a concert but I can’t go because my employer is now paying me to go to the concert because I was scheduled to work that night. The bottom line is people are going to start opening their establishments in St. Paul or other neighboring cities. Minneapolis will only be as strong as it’s businesses [especially small businesses] but this seems like a sure way to put small businesses out permanently and focus on corporations that can afford such extreme measures. I’m all for all of these policies, but I feel bad for my employer since I’m treated very fairly and they help accommodate me and my schedule constantly. Sometimes I want to work a double, but now I can’t work past 8 hours since they can’t afford to pay me overtime.. I’m not sure this is the benefit of all employees. We should be working on creating a harmonious work environment, not one that pins employees vs. employers. In April, an intense fire devastated historic buildings on West Broadway. After a press conference raised the possibility of arson, investigators are no closer to knowing what happened, while the neighborhood is rebuilding. “You already had a press conference with the fire chief,” Marie Egbujor told me. “They probably don’t know who did it. It’s pretty dead right now, business is pretty down.” But was it arson?